Another day, another iOS beta! Apple has released iOS 11.4 beta 6 to those iPhone and iPad devices enrolled in the iOS beta testing program. This build arrives a few days after beta 5 of iOS 11.4 was released for the same devices. 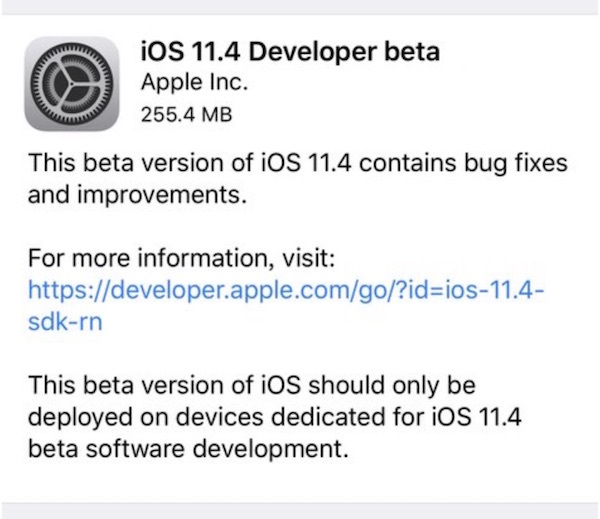 If you are currently beta testing iOS, then iOS 11.4 beta 6 is available to download now from the Software Update mechanism found within the Settings app. iOS 11.4 beta appears to mostly focus on minor bug fixes and enhancements, though testing of the Messages on iCloud feature is included as well. iMessages in iCloud aims to improve syncing of iMessages across devices by maintaining all Messages and iMessage content directly in iCloud. Previously, Messages in iCloud was being tested in prior iOS builds but was removed before they shipped tot he public. The current final stable builds of macOS and iOS are currently versioned as iOS 11.3.1 for iPhone and iPad and macOS 10.13.4 High Sierra along with Security Update 2018-001 for Macs. It’s fairly routine for Apple to issue several beta releases of system software before issuing the final version to the general public. Most assumptions are that the final release of iOS 11.4 (and macOS High Sierra 10.13.5 for that matter) will arrive sometime near WWDC 2018 on June 4.